There is no moon in the sky. Perfect conditions for candling. Come, I say to my long-suffering husband, you are taller than me. It’s easy, I tell him. I’ll keep the torch in my mouth and hold the hatch up while you reach in. Do it quickly. She knows you are afraid. No, of course I don’t know if they can smell fear. But don’t risk it; she might go for your eyes. In the way that other women might have picked up crochet or knitting, I began dabbling in poultry. Truthfully, it filled many receptors. I had just emerged from a particularly fertile experience with a pair of guinea pigs. They had arrived in the same manner as my dogs, cats, parrot, lovebirds, and even a lame pigeon. But I had greatly underestimated the sheer reproductive capacity of two young guinea pigs, and while I enjoyed guinea pig midwifery as much as the average animal lover, it was soon apparent that I was out of my depth. I found good homes for all fourteen guinea pigs, began dismantling the complicated housing system that had taken over several areas of my home, and started to think seriously of what would give me as much pleasure while making a contribution to the household. It was not long before I stumbled upon chickens. 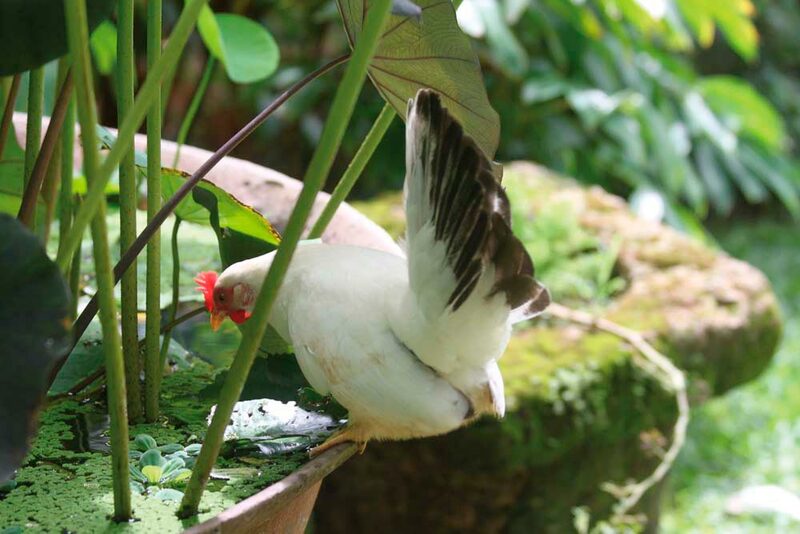 On a Christmas holiday in Tobago, a hen hatched a small brood of chicks in a garden bed outside our villa. Over the course of a week, we watched as the little mother marshalled her offspring up and down our long verandah. I was smitten. 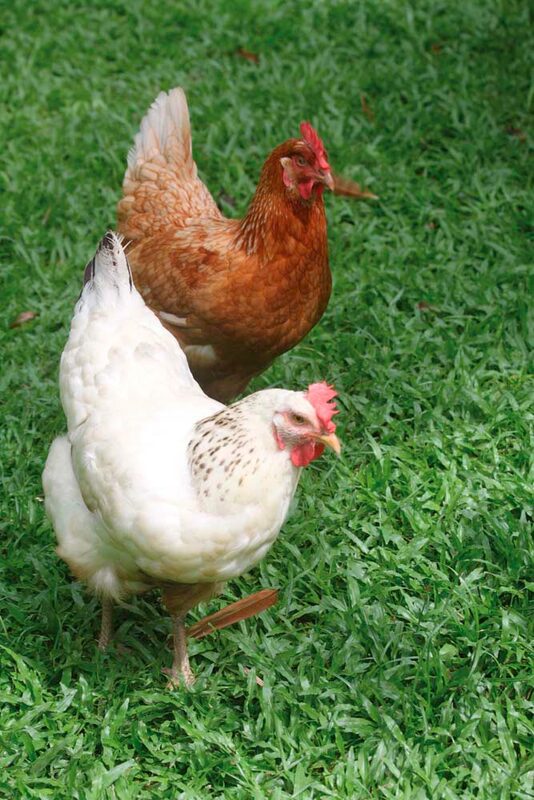 While still in Tobago, I Googled “raising chickens.” Eureka! Who knew? Raising chickens had suddenly become the thing to do. There were blogs to help me set up a coop, blogs advising on the most reliable layers, and blogs on reforming broody hens. I had no idea there were so many types of chickens. What was a bantam? And did I need one? As a good Trini girl, I’d grown up assuming that no one kept chickens. Chickens just were. They lived on the sides of roads, roosted on anything high, ate voraciously (including a disturbing cannibalistic penchant for Kentucky Fried), and provided the zeppo that you’d stayed out too late if the roosters were crowing when you climbed into bed. We paid them no more attention than the birds in the trees. But times were a-changing and it seemed I was very late on the chicken bandwagon. Chickens made sense to me. I run a big garden. They could free-range and I would benefit from the nitrogen-rich manure. They would turn my beds and keep my cinch bug and mole cricket population under control. And best of all, I would be able to collect fresh eggs and crack them, still warm, into a waiting frying pan. It makes sense, I said to my husband. It’s all about symbiosis. You’ll see. My friends tease me that I have a small townhouse for my girls. But, in reality, the little wooden and chicken-wire coop was erected in just two or three days. I got the design online and was soon feeling very chichi as my builder Luke (I’m not very handy with a hammer) and I stood admiring my pretty little coop. There was ample room for the chickens to run around downstairs, while a small ladder led to an upper floor where they would sleep and lay lots of eggs. I was set. I’ll take two of each, I said to the man standing behind the pet store counter. And five pounds of growing mash. I felt decidedly farmer-ish as I made my way home with two Plymouth Rocks, two Rhode Island Reds, and two beautiful Delawares. Six chicks. Long story short: I ended up with five (FIVE) roosters and one hen. The roosters, after many a skirmish, no eggs, and one bedraggled hen, ended up at the zoo, where they now live with a cocrico and a few agoutis. After this experience, I settled down and did my homework. No random buying of pretty chicks. I called Ibrahim’s, the local distributor for all things chicken, and ordered two chicks from their upcoming batch of layers (guaranteed to be hens). We’ll call you, the lady on the phone said. But come as soon as you get the call. They go fast. After my rooster experience, I could appreciate her point. And so they arrived, these little one-day-old balls of fluff. They had to be kept warm, and they lived in the kitchen in a birdcage until they were old enough to go into the coop. For months, after they’d become adolescents, instead of going to bed in the coop, they would arrive in my kitchen and try to nest in my bookshelves. In anticipation of eggs, I began supplementing their feed with spinach, kale, and watercress. And they did their part as well by catching (and devouring) the occasional lizard. By this time, the bug had bit me hard. My original hen was laying an egg or two a day to much excitement and culinary experimentation (omelets and custards galore). I began scouring the classifieds for unusual chickens. And just like that, a whole world unfolded before me. All over Trinidad, there were chicken aficionados. Did I want Japanese Bantams? Yes, sir, I did. Did I want Silky Bantams? Absolutely. I trekked around the country and visited obscure backyards where I saw all manner of chickens, some of them beautiful creatures. Inevitably I ended up with a rooster or two — like a black Silkie with turquoise ears who was so exquisite-looking and so full of personality that we kept him until he crowed himself out of a home (he, too, is now at the zoo). The Japanese Bantams were tiny and perfect, and I did manage to hatch a brood of eleven before giving the rooster and most of the chicks to a friend who had no neighbours. It’s been a wild ride. I now have four large hens that give me something in the range of four to six eggs a day. These are the eggs we collect and eat. Big healthy eggs with saffron yolks and tight whites that fry up like poached eggs. When I traded my last prize Japanese Bantam rooster, the transaction was with a serious breeder in the back of Santa Cruz. He kindly gave me four fertilised eggs that are developing nicely in my incubator as I type this sentence, an adolescent hen that looks like a road runner (I’m told she is a Clean Neck Bantam mixed with a Puff), and two chicks (I’m not sure exactly what they will turn out to be) who have taken up residence with the cockatiels until they are old enough to go into the coop. So did the symbiosis work? I think so. I spray with chemicals only if it is absolutely necessary. The chickens free-range during the day; creatures of habit, they return at dusk, like clockwork, to climb their ladder and sleep. I use their soiled bedding (wood shavings) as manure on my garden beds. There is the real satisfaction of self-sufficiency. And they provide lots of entertainment. Gertrude is broody. The adolescents are skittish. Doris is a sweetie. Japanese Bantam is a lady. And Road Runner is stark raving mad. We still haven’t mastered the art of candling with a LED torch (even on moonless nights), so I’ve ordered a special torch specifically designed to help me identify “good” eggs with viable embryos from the duds. My husband asks: What developing eggs? It’s a logical question, as there are no more roosters. I haven’t yet told him about the batch of fertilised quail eggs on order. But that’s another day. Another adventure. PS: the zoo says no more roosters. They are full. Preheat oven to 350ºF. Beat eggs enough to mix yolks and whites together. Add sugar, vanilla, and salt. Slowly add milk (stirring, not whisking, as you don’t want too much air incorporated). Place six ramekins in a large baking tray. Pour mixture into ramekins. Fill the baking tray with water so that the ramekins are sitting in a “bath” that comes halfway up their sides. Bake for 45 minutes. Check that a knife inserted in the centre comes out clean before removing cups from water. Let cool. Unmold and serve warm with guava stew, or chill and serve as a cold dessert.